Green 1 student projects from their Eric Carle author study. 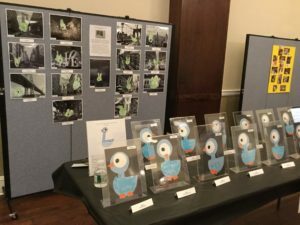 The 76th Street teachers and staff were committed to setting up a spring event for children, families and teachers to come together as a community. 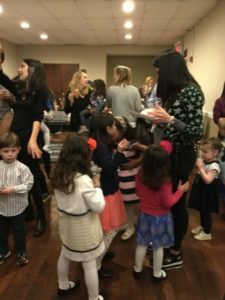 United Nations Day and Winter Solstice, two of our biggest school events, are both held in the first part of the school year; Museum Night provided an opportunity to celebrate in the spring. Another purpose of Museum Night was to celebrate the play-based, rich curriculum being facilitated in our classrooms. When a child is allowed to display and share his/her work, positive self-esteem is built and a sense of pride is taken in one’s creations. 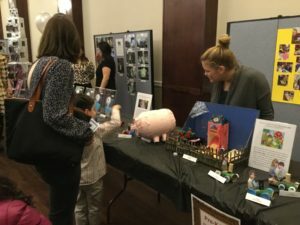 Families observing the Pre-K 2 table, displaying their Charlotte’s Web-themed book study projects. Throughout the winter months, the Green and Pre-K Rooms’ curriculum focused on author and book studies. The Green 1 class’ author study was on Eric Carle’s books; Green 2 concentrated on books written by Mo Willems. In Pre-K 1, the children read books with New York City as a setting. Pre-K 2 and Pre-K 3 listened to chapter books: Charlotte’s Web and My Father’s Dragon, respectively. 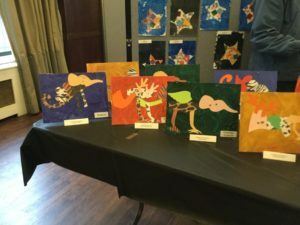 In all of the classrooms, the children created art projects, played games, and worked on math, science, and other thematic activities based upon the author and book studies. Coming together as a community at Museum Night! Green 2’s display of Mo Willems-themed projects from their author study. 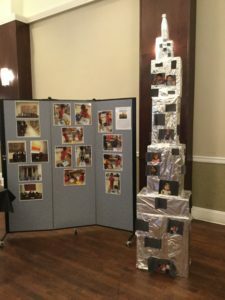 On Museum Night, the Green and Pre-K teachers filled the ballroom with art projects (both individual and whole group), books (created by the Pre-K classes), photos and videos (both in print and on iPad slideshows) of their author and book studies. 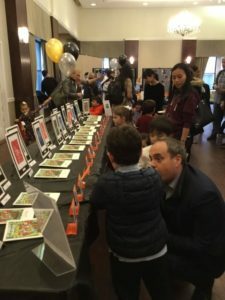 From 5:30pm to 6:30pm, families and children perused the third floor ballroom, observing not only their child(ren)’s work, but the work of their schoolmates. Brochures were available for families as a “guide” to Museum Night; the Pre-K 2 class created bookmarks to sell at the event. Pizza and beverages were served as well. The RSVP list consisted of 200+ guests, cementing Museum Night’s status as a huge success! Another achievement from the celebration: the 76th Street location received $600 in donations from families, all of which will go towards funding special performances and class trips for our students. The donations were requested on a “pay as you wish” basis, much like how one would pay to enter a museum here in New York City. Thank you to all of the families, children, and teachers who attended and supported Museum Night 2019! We are looking forward to another successful event in 2020! Interested in joining the IPS community? Learn more about our classrooms by clicking here.